you will find all the land you need and want here in Taos. We offer the most pristine land real estate in Taos, NM. Taos Real Estate We have land out past Hondo Mesa, across the Rio Grande Gorge and about 8 miles to the north at Cierra Montosa. There is hundreds of acres for sale out here with the best views money can buy and that Taos has to offer. The land is pure and untouched. We actually just started building a road just to get to it!! Taos Land & Film Projects We are also involved with filmmaking. 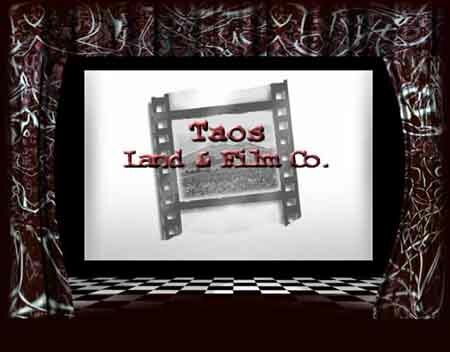 Taos Land and Film sponsors the 5 acre land grant with the Taos Talking Pictures Film Festival. Screenplay Contest Taos Land and Film also hosts the Taos Land & Film Annual Screenplay Contest. Of you have a screenplay that you feel is a winner, be sure to mail in your entry form as soon as possible. The 3rd Annual Screenplay Contest is just about to go public. The deadline is Febuary 28th. Unlike other screenplay contests, the Taos Land & Film screenplay contest offers not only an option for the screenplay, but also a beautiful 5 acre piece of pristine Taos land worth over $30,000 and its value will never stop increasing. The Land Grant More specifically, the 5 acre land grant is the highlight of the Taos Land & Film Annual Screenplay contest. The land you receive is plotted within the filmmaker's community; a community that consists of all the other past land grant winners. What better place to be inspired than on 5 acres of Taos land overlooking the vastness of Taos, NM. and the Rio Grande gorge.